In April, construction got underway to create a lift connection between the Maiskogel and Kitzsteinhorn ski areas. Already this year, in December 2018, the MK Maiskogelbahn and multi-function Kaprun Center will open, realizing the first stage of Kaprun’s generational project. One year later will see completion of the 3K Kaprun-Kitzsteinhorn-K-onnection – Salzburg’s very first tri-cable gondola. 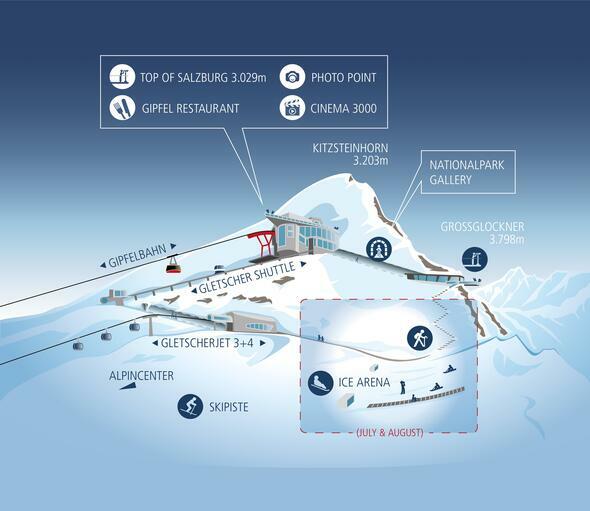 As of winter season 2019/20, it will then be possible to reach the mountain station on the Kitzsteinhorn (TOP OF SALZBURG, elev. 3029 m) directly from the town center of Kaprun (768 m) via the Maiskogel thanks to a 12 km-long string of pearls consisting of six different lifts. At €81.5 million, the K-onnection is the biggest investment project in the 50-year history of Gletscherbahnen Kaprun AG, bringing enormous economic importance and tourism charisma to the entire region. Thanks to the gondola link between the Maiskogel and Kitzsteinhorn ski areas, a wish that has been nurtured for generations is about to become reality in Kaprun. As of this coming winter season, the new 10-passenger mono-cable gondola will bring added quality to the Maiskogel experience. Delivered by South Tyrol-based lift manufacturer Leitner, the lift – consisting of 123 cabins and taking just twelve minutes to rise to the top – will be able to transport as many as 2800 people per hour. The opening of the new MK Maiskogelbahn in December 2018 will bring a whole series of benefits: The new Stanger mid-station (elev. 1137 m) will provide families, beginners and ski schools with optimal access to the broad, flat pistes there. The elevation of the second section served by the gondola (1137 – 1570 m) insures that, because of the opportunity to ride all the way down to the valley from the Stanger mid-station on the new MK Maiskogelbahn, ski season on the Maiskogel will begin earlier and end later in future. The Maisilift and the Almbahn – which are located in the upper area of the Maiskogel ski area – will continue to operate as before. Summer 2019 will celebrate yet another premiere: For the first time ever, the Maiskogel will be reachable by gondola right from the town center of Kaprun itself. This will provide locals and guests with an ideal gateway to the existing hiking and biking trails on Kaprun’s popular family mountain. The Maisiflitzer was upgraded in March 2018, now incorporating the very latest technology, while the Alpine Coaster will continue to remain open year-round. In December 2018, the new Kaprun Center will also be opened. Located right in the town center, not only is it the valley terminal of the new MK Maiskogelbahn, as of December 2019 it will also be the starting point for the K-onnection up to the Kitzsteinhorn. This multi-function building will bring together the ticket windows, Intersport Bründl Maiskogel – a modern, spacious sporting goods store and rental center – as well as a big ski depot under one roof. In this depot, guests staying in town will be able to store as many as 2,000 pairs of skis and boots, then make their way conveniently on foot, or using the ski and village buses, back to their hotel. The Kaprun Center will likewise serve as the future corporate headquarters of Gletscherbahnen Kaprun AG. Next year, in December 2019, thanks to the 3K K-onnection the final gondola link will be made in the string of pearls rising all the way up to the Kitzsteinhorn. Salzburg’s very first tri-cable gondola, delivered by Austrian lift manufacturer Doppelmayr, will then carry guests from the Maiskogel up to the Langwied area of the Kitzsteinhorn. Beginning with winter season 2019/20, it will be possible to ride directly from the town center of Kaprun (768 m) via the Maiskogel to the TOP OF SALZBURG on the Kitzsteinhorn (3029 m) thanks to a string of pearls consisting of six gondola lifts. Which means, for the first time the Kitzsteinhorn will offer “ski-in-ski-out” convenience and put itself in the top league of Alpine ski areas. It will create a unique connection between the 100% snowy glacier ski area and the tourism businesses in town. This unique panoramic gondola represents the longest continuous lift line (traveling a distance of 12 kilometers) and the greatest rise in elevation in the Eastern Alps. “With the opening of the MK Maiskogelbahn, we are taking the first major step in implementing this generational project. The direct connection from Kaprun up the Kitzsteinhorn as of 2019 will herald a whole new era for Gletscherbahnen Kaprun AG, the town of Kaprun, as well as the Zell am See-Kaprun region and its outlying communities”, states board chairman Norbert Karlsböck with total conviction. The Kitzsteinhorn in the Zell am See-Kaprun Region is the only glacier ski area in Salzburger Land. At 3000 m, winter sports fans can count on one-hundred-percent-reliable snow conditions from October until early summer. Thanks to the Maiskogel, Kaprun boasts a second – family-friendly – ski area that, because of this generational project, will now be linked with the glacier directly. As a first step, in December 2018 the MK Maiskogelbahn will be opened, a mono-cable gondola up the Maiskogel. One year later and the 3K Kaprun-Kitzsteinhorn-K-onnection from the Maiskogel to the Kitzsteinhorn will go into operation. This first tri-cable gondola lift in Salzburg will carry passengers from the Maiskogel straight up to the Langwied area on the Kitzsteinhorn. As of December 2019, it will then be possible to ride a twelve kilometers-long string of pearls consisting of six lifts, directly from Kaprun town center (768 m) via the Maiskogel to the mountain station on the Kitzsteinhorn (TOP OF SALZBURG 3029 m). This 12 km-long string of pearls will not only represent the longest continuous gondola corridor, it will also rise the greatest elevation (2261 m) in the Eastern Alps, doing so with the greatest of ease.